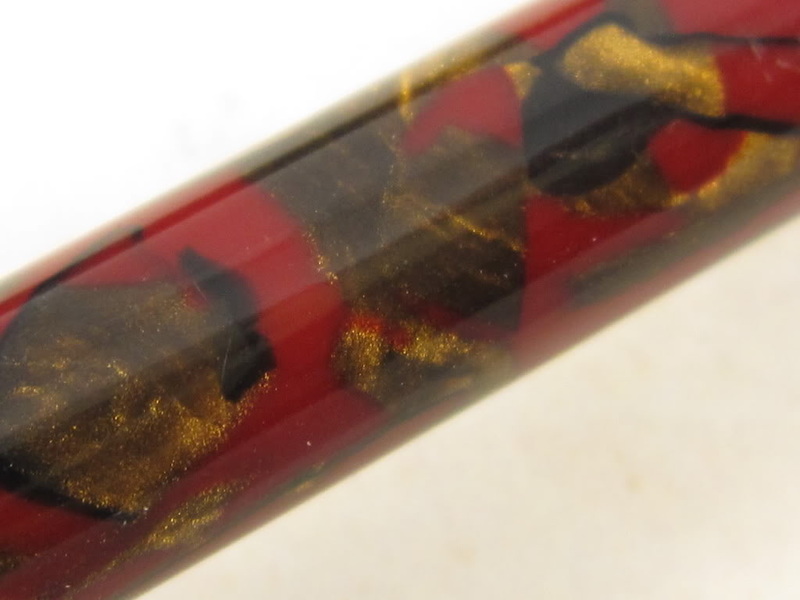 The most common myth about flexible nibs for fountain pens is the claim that flex nibs are only capable of being used when written with very little pressure (barely touching paper) and at a very slow speed. This is simply and 100% incorrect ... and a pure myth usually claimed by individuals with very little experience, knowledge, and skills with flexible nibs. There are many flexible nibs for fountain pens which are capable to be used as regular nibs when no pressure is applied. These nibs can also be used as flex nibs if you slow down your writing speed a little to enjoy doing some thin and thick lines and achieve nicer penmanship results. 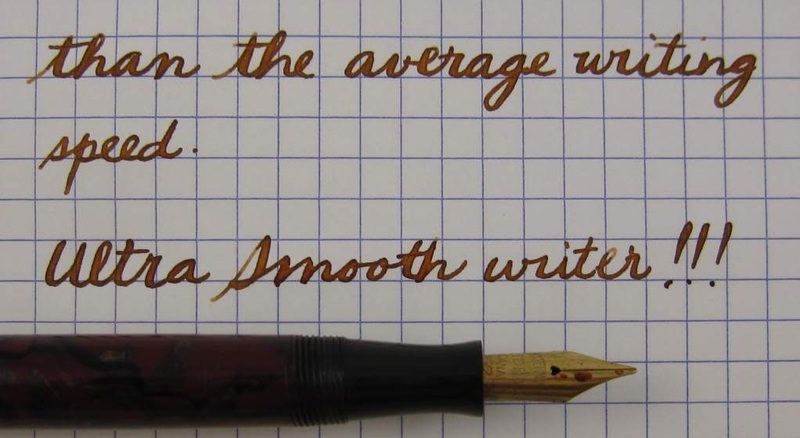 In most videos of individuals writing with flexible nibs, you will see them writing at very slow speeds and barely touching the paper. Why? To get the most beautiful forms of penmanship, including professional calligraphy, a very slow speed is recommended. To get the thinnest hairlines with ultra thin and ultra flexible nibs, writing slow is very important to get the proper thin line definition. However, a lot of those flex nibs can be written at any speed when not flexed. It is also very important to be aware that holding the pen properly is imperative so that all the different nib attributes can be nicely enjoyed without risking damage to the flex nib. Another imperative is having a flex nib which tines are nicely aligned. 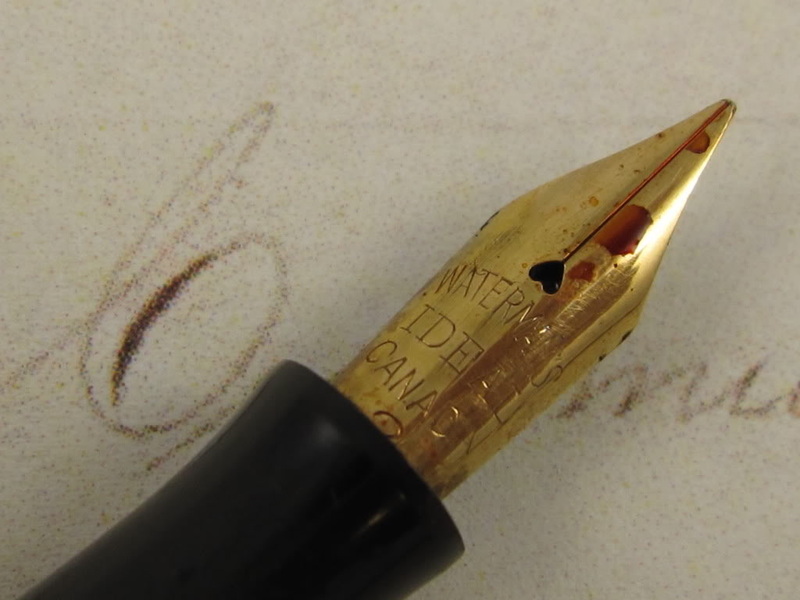 Regardless of the nib being vintage or modern and flexible or firm, a misaligned nib will be prone to scratchiness whether you write at a slow, medium or fast speed and whether or not you flex it or not. And last, but not least, the smaller the "foot" of the nib (the iridium area of the nib that actually makes contact with paper), the more prone to scratchiness that nib will be. For example, a superflex XXXF nib will be more prone to scratchiness than a superflex fine nib, making it harder to write at a fast speed. As a big lover of flexible nibs, I greatly enjoy using flexible nibs that are not only great flexy writers but also normal nibs when not flexed. The following pen is a classic example to illustrate that most flex nibs can be written at any speed when not flexed. The last time I used this fountain pen, it stayed in my rotation for over six weeks ... and I could not get enought of it. I love the pen in itself, the nib, the paper and the ink used. They are simply a perfect match for each other. 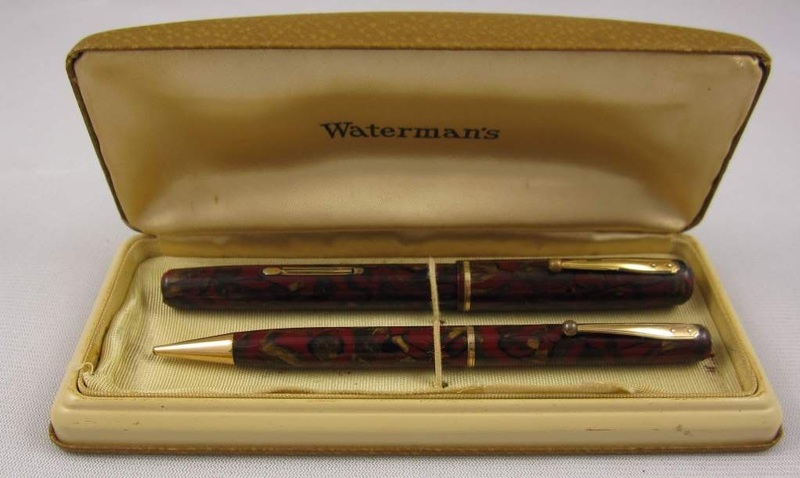 The pen is a vintage Waterman 92 in marbled red and bronze celluloid with gold trim. It has its matching pencil and box. The celluloid in the fountain pen has darkened a little while the pencil has seen very little use and look almost like new. Made in Canada in the 1930s. The nib is a Canadian 14K Waterman Ideal #2 nib. At plain sight, this nib may look like a standard Waterman nib. However, when put into action this nib has very unique and wonderful characteristics. It is an ultra flexible nib, a "wet noodle" nib capable of writing a medium to triple broad line. What I like the most is that this nib writes and performs just like a regular nib when not flexed. It allows writing at any speed ... and done with the ultimate smoothness found in the best nibs in the marketplace. Want to have a little flex writing fun? Just slow down the writing speed a little and enjoy some flair writing thin and thick lines. Want to have lots of fun? Slow down and flex it. 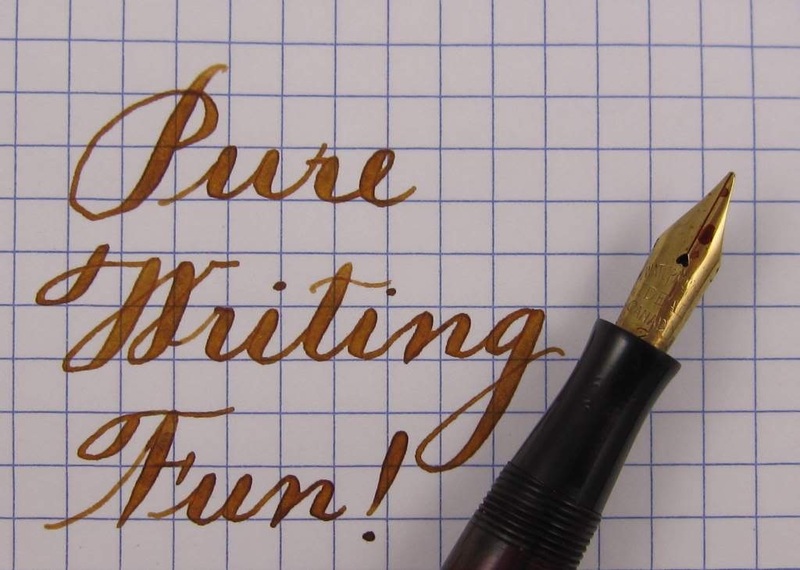 Yes, flex it, this nib is made for that ... and enjoy huge line variation ... pure writing fun! For those of you who believe that all flexible nibs can only be used for very slow writing, that assumption is incorrect ... and very far from the truth. There are a lot of flexible nibs that are very smooth and that have these wonderful capabilities of writng like a normal nib when not flexed and like a flexible nib when pressed. It is like having two pens and nibs in one. These nibs are also more forgiving to both, experienced and unexperienced flexy writers. The writing samples below were all made with the same pen/nib. 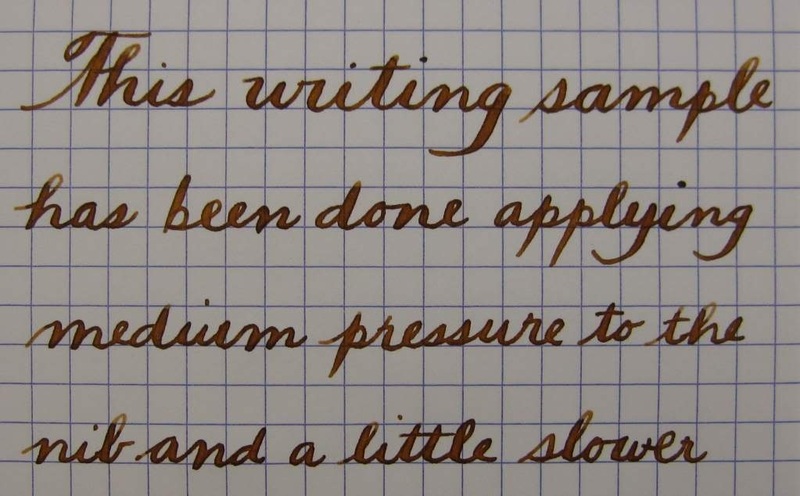 The only difference was the amount of pressure applied to the nib and the speed of writing. So no more thinking that all flexible nibs are only for the professionals or for the experienced flexy writing hand ... or that you always have to write very slow. And bear in mind, the nib in this pen is a wet noodle with maxiumum flexibility on the nib tines. 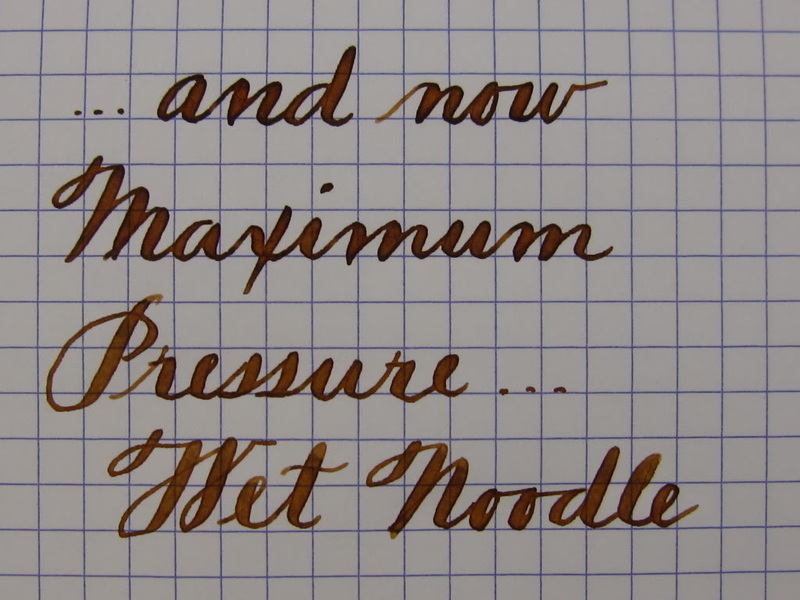 Imagine how much more forgiving will be a nib with less flexibility than a wet noodle! 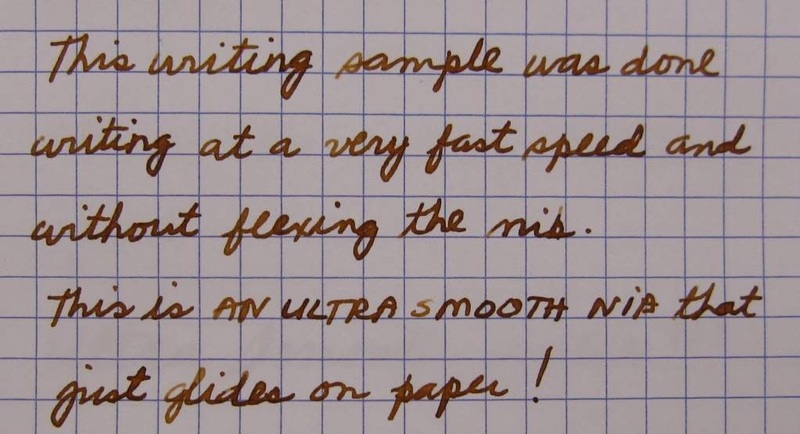 The ink used in these writing samples is Diamine Sepia and the paper is Rhodia Block 13 with 5x5 mm squares. Applying maximum pressure to the nib ... the first writing sample was done at a very slow speed for nicer penmanship while the second was done at a slightly slower than normal writing speed. Another interesting observation is that very flexible nibs will also lay quite a bit ok ink on paper when flexed and/or written at a slower speed. These two actions will, in turn, create a wider ink shading range. If you use light ink colors, you will be able to enjoy an even wider color spectrum, varying from a very light to a very dark color, all in the same letter and word. In the following two pictures, please notice how much darker the writing sample can become by applying different levels of pressure. And what happens when you flex a wet noodle nib to its maximum capabilities and use different speeds of writing? The amount of ink laid on paper will vary. The first sample was done writing at a very low speed creating more ink saturation and leaving a darker color finish while the second at half ways between very slow and normal writing speed, laying the normal amount of ink and leaving the normal color hues of this ink.